Biography: Elizabeth was rescued from a kill shelter by North Shore Animal league, spayed, given shots and put up for adoption. We were lucky enough to find her at a Petco adoption event -- and now she runs the house! We don't know anything about her background -- but she is precious, priceless. At this point, we think she is convinced that this is her forever home and that nobody is going to take her away, ever again. 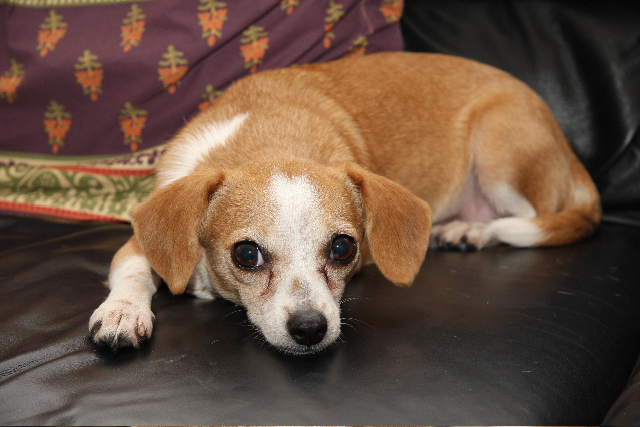 Elizabeth looks to be a mix of Chiuahua and Beagle and shows characteristics of both. (She is very territorial and loves to cuddle ... and has a Beagle appetitie. Whatever happened in the past, Elizabeth is now completely adored -- and we are looking forward to sharing many years together.